The relationships of the 'fingerotters' and the 'fishotters' (as the Germans put it) has always been problematical. It seemed logical to assume that the clawed otters were related to one another, and that those with vestigial claws were related, but exactly how has been debated for the last century. Sometimes, all three clawless species have been put in the same Genus, whilst at other times they have each been assigned their own. Sometimes, all otters have been considered to belong to Genus Lutra. According to Harris (1968), the species was first described as Lutra cinerea by lliger in 1815; to confuse things, in the same year, he also described it as Amblonyx cinereus. During the rest of the 19th Century, the animal was renamed frequently, often twice in the same year by the same person, becoming, amongst other things, Aonyx horsfieldii (Gray 1837), Leptonyx barang (Lesson 1842), Aonyx leptonyx (Blyth 1863), Lutra barang (Blyth 1863), Aonyx leptonyx (Anderson 1878), Lutra cinerea (Thomas 1889) and Aonyx sikimensis (Thomas 1889). Things slowed down a little during the 20th Century, with only three major renamins: Lutra cinerea (Pocock 1921), Amblonyx cinereus (Pocock again! 1921), Micraonyx cinerea (Allen 1922) and Aonyx cinerea (Ellerman & Morrison-Scott 1951). For a while things settled down, and everyone knew what to call this animal. 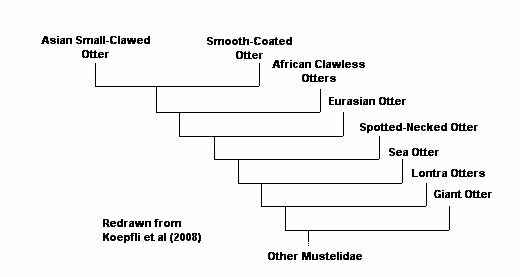 Then the work of Koepfli et al (2008) made it clear that this is the latest of all otter species to arise, but that unexpectedly, rather than having the other clawless otter, Aonyx capensis as its closest relative, it is more closely related to the Smooth-Coated Otter, Lutrogale perspicillata!. English : Asian Small-Clawed Otter, Asian Short-Clawed Otter, Oriental Short-Clawed Otter, Chinese Dwarf Otter, Asian Clawless Otter, Malaysian Small-Clawed Otter, and, most charmingly, the Laughing Otter of India.